These remarks were delivered at the Center for American Progress event, “America’s Relationship with Africa in a New Era,” on July 13, 2017. With today’s political environment demanding focus on immediate crises at home and abroad, it is easy to neglect the long-term priorities that will profoundly shape America’s position in the world in the decades to come. But one foreign policy area that the United States cannot afford to neglect is its relationship with the African continent—with all its possibility and volatility, its risks and its rewards. Of course, when we talk about the U.S.-Africa relationship, what we are really talking about is a whole series of very complicated bilateral and multilateral economic, political, social, and personal relationships across a terrifically diverse continent. The United States should build upon the investments made by the Obama administration in these ties and work to unlock Africa’s tremendous potential to be a powerhouse of future growth lifting millions out of poverty, a substantial market for U.S. goods, and a breadbasket to the world. 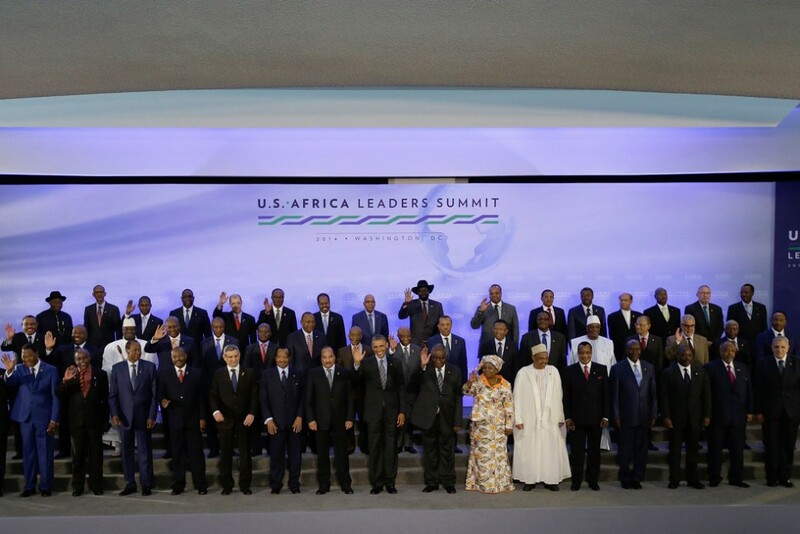 The dynamism of these relationships was on full display in August 2014, when 50 African leaders joined then-President Barack Obama in Washington for the first-ever U.S.-Africa Leaders Summit. It was a watershed moment and a tangible sign of the maturation of U.S. policy toward Africa. The summit was remarkable for many reasons, but especially for the degree to which African leaders came with clear priorities focused on moving Africa forward and the opportunities available on the continent. They wanted to talk about trade, foreign direct investment, resource management, and the environment. And they were deeply concerned by the challenge of producing sustainable energy. Leaders also made it clear that security issues were central to their economic visions, with an understanding that peace and prosperity must move forward together for either to be sustainable. The gathering helped cement initiatives such as Power Africa and Feed the Future. Ambitious projects like these can sometimes seem like distant dreams, but they are crucial, constructive foreign policy guideposts built around carefully constructed legislative asks. Indeed, policy experts from both parties worked together to secure bipartisan support on Capitol Hill for the Global Food Security Act and the Electrify Africa Act. Such thoughtful, serious engagement advances the interests of both the United States and its African partners. Of course, there is no one simple truth with Africa. Yes, it possesses enormous economic potential and is well-positioned to benefit from rapid technological change. The breakneck expansion of mobile technology is remaking everything from banking and energy to health care and small business growth. Foreign direct investment has more than quintupled since 2004. More and more governments are making the infrastructure investments and economic and political reforms necessary for lasting growth. At the same time, deadly famine and drought continue to stalk East Africa, where the United Nations estimates that 16 million people currently require humanitarian assistance, up by about 30 percent since late 2016. In East Africa, we are seeing how potent and deadly the mixture of drought and environmental crises can be together with conflict, failed governance, and economic shock. And inevitably it is the most vulnerable who suffer most in these situations: women, children, and traditionally disenfranchised groups excluded from political power. The situation in South Sudan—so recently full of hope—painfully underscores just how quickly the aspirations of a people can be cut down by venality and violence. And there is reason to worry that this dangerous mixture of man-made and natural crisis will spread. The overwhelming scientific evidence points to a century in which climate change worsens food insecurity and water stress, and droughts and desertification become ever more common. Already, Morocco, Tunisia, and Libya lose 1,000 square kilometers of arable farmland each year. In Egypt, half of all cultivated farmland is threatened by salinization. Morocco and Algeria are both projected to face freshwater scarcity by 2025. Similar trends are projected to affect highly populous and fast-growing sub-Saharan African countries such as Nigeria and Niger. None of this bodes well for future stability. These conditions will likely accelerate human migration within and from Africa, further complicating humanitarian and government responses. And none of this comes as a surprise. These dynamics were on display 1.5 years ago at a two-day future scenario exercise called Food Chain Reaction, convened by the Center for American Progress, the World Wildlife Fund, and the Center for Naval Analyses. The war game gathered policy leaders, climate negotiators, agricultural and environmental experts, and business people from around the world here in Washington to game out a scenario—set in the years 2020 to 2030—in which environmental and market conditions combined to severely strain the global food system. One of the key takeaways: Food security and climate change are not just humanitarian or environmental issues—they touch upon core national security interests and the stability of entire regions. The complex crisis facing the participants was modeled on the challenges we have faced in the past decade, particularly in the 2010–2011 food crisis. But we’ve seen from the past decade that these challenges are outpacing established policy mechanisms and deserve a fundamental rethink of how governments, international institutions, and businesses respond. Unfortunately, the current administration in Washington is asleep at the wheel. It is likely no coincidence that the G-20 session which President Donald Trump skipped was on “partnership with Africa, migration and health.” The Economist reports that “five of the eight most senior posts in the [State] [D]epartment’s Bureau of African Affairs are vacant or filled by people in an acting capacity,” while senior political appointees are likewise lacking at the U.S. Agency for International Development (USAID). No one inside or outside of government understands what this administration’s approach to Africa will be—currently, we are neither addressing the real crises facing Africa today, nor positioning the United States to benefit from more dynamic trade with and growth on the continent. That is a real opportunity lost for all sides. What we do know about the Trump administration’s approach to Africa thus far is deeply concerning. Proposed budget cuts of more than 30 percent to the State Department and USAID would be disastrous. These proposed cuts are demoralizing for our diplomats and baffle most of our men and women in uniform, who see diplomacy and development as essential complements to their efforts to provide security to the United States and its partners. Frankly, the budget proposals for the State Department and USAID do not seem to stem from any serious analysis or review. For example, the notion that we would eliminate something as sensible and cost-effective as the Famine Early Warning Systems Network—in the middle of the East African drought—is irresponsible. Thankfully, there is bipartisan resistance on Capitol Hill to simply gutting the State Department and USAID. Likewise, military leaders and the business community have voiced their resistance. The budget fight will likely stretch out for some time, but there is also a dangerous misperception in this administration that Africa policy should simply be handed over to the generals. There are several problems with this approach. First, this vision sees an entire continent and its people simply as a “threat,” a place from which problems emanate, ignoring the enormous potential that Africa holds. Second, by abandoning the economic playing field in Africa, we might as well print up “Make China Great Again” hats, and Beijing certainly understands the incredible trade and investment opportunities on the continent. We are handing economic and political influence to their authoritarian model. Finally, a militarized approach is costly and inefficient. Investing in preventive development assistance is far cheaper than allowing grievances to fester until they require harder responses. As Foreign Policy has pointed out, for example, the $28 million 2017 budget request for the U.S. African Development Foundation costs less than a single Apache attack helicopter, yet its grants to grassroots organizations benefit more than 1.5 million people in the Horn of Africa, Sahel, and African Great Lakes regions. Again and again, we have seen evidence that no one in the Trump administration has taken a serious, sober look at these issues and what they mean for the future of Africa and for the United States. While U.S.-African relations are built around the personal commitment of enormous numbers of people in the United States and across Africa, they can ill-afford years of neglect. It is incumbent upon the United States to advance a shared vision for the future of its relations with a fast-growing African continent. Former Sen. Tom Daschle (D-SD) is the chair of the Center for American Progress’ board of directors. He previously served as the Senate majority leader.